As a way to show his students the effects of wave interference, physics teacher Roger Siegel set up two speakers on the green outside of the Media Center. 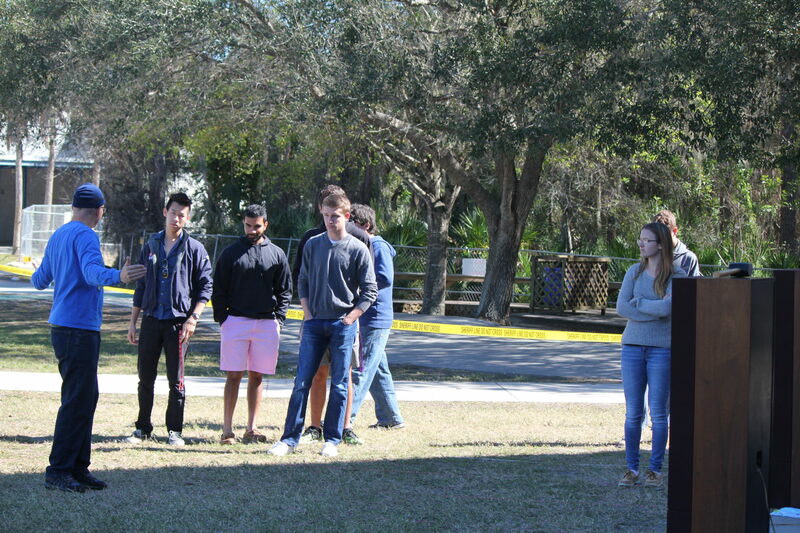 Students from different grades benefitted from this experience that took place Friday Feb. 12. Siegel’s AP Physics I class recently studied sound waves, and he conducted the demonstration to help better his students’ understanding of the topic at hand. To begin the experiment, Siegel had the students walk around a grid made of string laid out on the quad, while playing the speakers, each at the same frequency. When walking through certain spots in the grid, students could hear the sound very clearly, while at others the sound being emitted was at a much lower volume. According to Siegel, this phenomenon is a result of wave interference. Wave interference is when two different waves crash together and either create constructive or destructive interference. “So there are two speakers, or sources, that emit sound waves which at certain places inside the box meet and make constructive interference or destructive interference,” Siegel said. At positions where the waves constructively interfere, this essentially creates a bigger wave and produces a louder sound. Likewise when the waves destructively interfere they combine to form a small wave that is harder to hear. To learn more go to Siegel’s website, where he has posted a link with a graph that shows more on what happen when waves interfere.